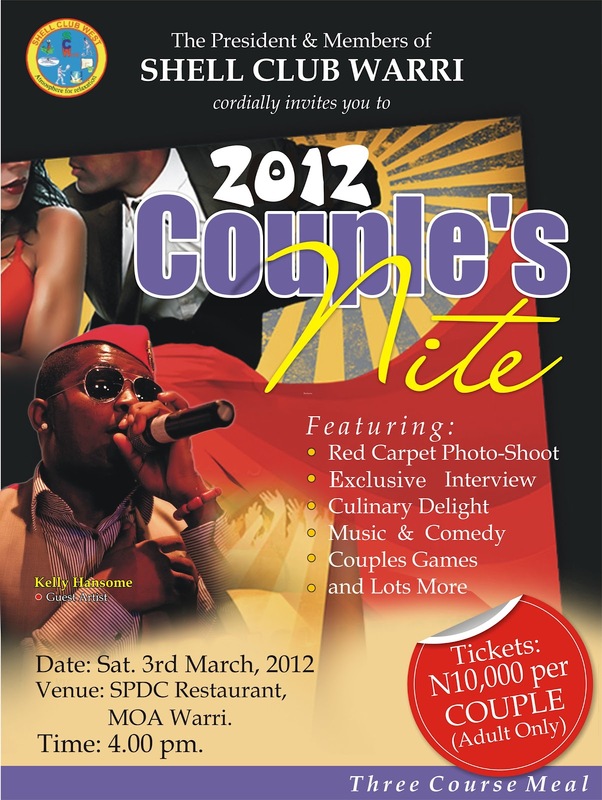 Shell club in Warri Delta state sets to hold its Maiden edition of its COUPLES NITE in grand style as the event will feature Red Carpet paparazzi, exclusive dinner and other activities such as artiste performance, couple games, comedy and lots more… This event is to be packaged and managed by a renowned Nigerian entertainment outfit (ZAIME MEDIA). platform for colleagues and friends of the Shell Club to set aside an evening out of their usual busy work life to unwind, network, have fun and connect . . . He also confirmed to us that there will be a live band performance by the popularly known Kennis Music former act, ”Kelechi Obinna” the too much money crooner aka Kelly Hansome. And also, Delta based highlife musician EMMA-GREY. The event is to be anchored by Nollywood actor Wale Adebayo(Shango). Including Red Carpet Photo shoot for couples, interviews and three course meals. Mr ”John Lotobi” who is the appointed Shell Club coordinator for the event also express his optimism on the success of the event and strongly believes that every couple who attends this event will have a lot to gain positively. 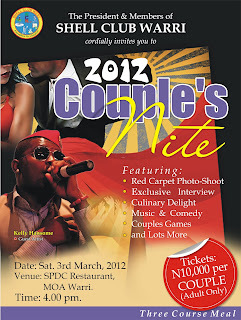 The event is scheduled for Saturday 3rd of March 2012 at SPDC restaurant MOA, Warri Delta state. Red carpets starts by 4pm prompt. Ticket is 10,000 naira per couple. Video: MAYTRONOMY, WETIN YOU DEY FEEL LIKE?